Is this present oil price sustainable? I believe 70-80 is sustainable through the end of 2018. 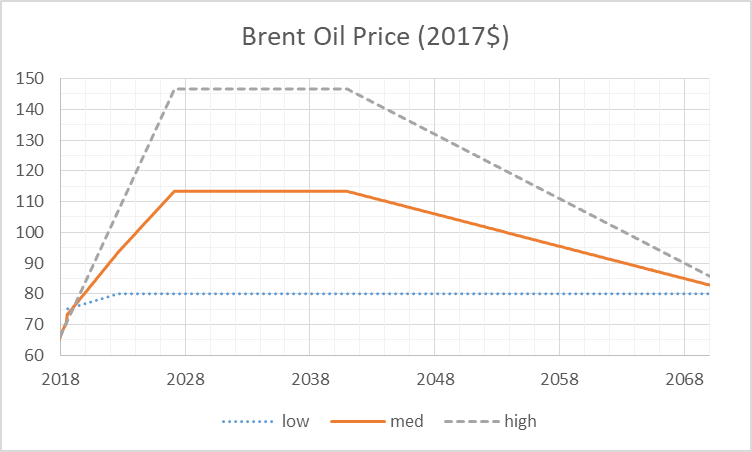 My oil price scenarios (real oil prices in 2017$) for Brent Spot prices (12 month centered moving average) in chart below peak prices are $80/b, $113/b and $147/b for the low medium and high scenarios respectively. I think we are likely to be somewhere between the medium and high scenarios (roughly a 70% probability that the actual 12 month centered average Brent spot price will fall between these two scenarios for about 70% of the period covered).